Blossom Hill Mennonite Church, 2016. The Blossom Hill Mennonite Church was originally begun as the Dillerville Mennonite Mission, which was an outreach of the East Chestnut Street Mennonite Church (Lancaster, Pennsylvania). It was located in the area of Manheim Township known as Dillerville and was especially focused on outreach to the children in that industrial community. The first services were held on 21 January 1934 in a small chapel formerly used by Grace Lutheran Church. Leadership was initially supplied by the East Chestnut Street congregation. The first superintendents were John E. Landis, Lloyd Weaver, and A. Nissley Rohrer. Due to expansion of the local Armstrong Industries plant during World War II, much of the Dillerville community was destroyed and the mission had to move. In 1942 a new building was constructed at 204 Stevens St., Lancaster, Pa., and the name was changed to North End Mennonite Church since it was located on the northern edge of Lancaster City. This was a time of gradual growth and independence for the congregation. No longer simply an outreach of East Chestnut Street, North End ordained Earl M. Wert as its first minister in 1946. While still reaching out to children, the church also was involved with evangelistic outreach to adults, including the Jewish community. A sewing circle was begun to address physical needs locally and globally as well. The congregation again moved in 1971, this time north of Lancaster City to 333 Delp Road, Lancaster (near Neffsville, Pennsylvania). The name was changed to Blossom Hill Mennonite Church in 1981. Interest in children continued at the new location and a community preschool was begun in 1972. The Kindernook Nursery School continued to operate until 1997. Blossom Hill was impacted by the charismatic movement in the 1970s. Several families left the congregation to participate in the newly-forming Worship Center, near Leola, Pennsylvania. Membership dipped in the 1990s and the congregation considered merging with another church or closing altogether. A handful of young adults joined existing church members and helped to increase attendance in the late 1990s, particularly after the hiring of Jane Hoober Peifer in 1999 as lead pastor. Many of these young adults began their own families so that by 2013 approximately half of Sunday-morning attendees were under the age of 13. 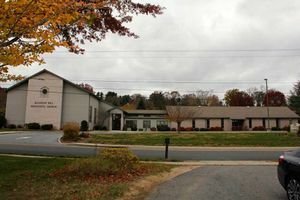 The congregation was part of the Lancaster District of Lancaster Mennonite Conference until 2009 when it joined the Atlantic Coast Conference of Mennonite Church USA. This move was due primarily to the Lancaster Conference position on women in leadership, as well as its approach to conference structure and congregational autonomy. Worship services in 2016 incorporated a blend of formal and informal elements. Worship followed the liturgical calendar, a capella singing was strong however instruments were often used for accompaniment. Most sermons were written and delivered by one of the pastors and occasionally by other church members or by visitors. Each service included a children’s time and children often contributed to the service by providing music or reading scripture. The congregation was primarily professional. Landis, Ira D. The Missionary Movement among Lancaster Conference Mennonites. 2nd ed. Scottdale, Pa.: Mennonite Publishing House, 1938: 76-77. Miller, John H. "The History of the North End Mennonite Mission." Unpublished paper available in the Lancaster Mennonite Historical Society Library. Wissler, Darlene J. "The History of North End Mennonite Mission." Unpublished paper available in the Lancaster Mennonite Historical Society Library. By Ira D. Landis. Copied by permission of Herald Press, Harrisonburg, Virginia, from Mennonite Encyclopedia, Vol. 3, p. 917. All rights reserved. North End Mennonite Church, Steven Street, Lancaster, Pennsylvania, was started at Dillerville in 1934. When the grounds were needed for the expanding Armstrong Linoleum Company, the building was salvaged and used in a larger brick building at the Steven Street site. Earl M. Wert, who was serving in 1957, was ordained for this mission group on 24 February 1946. The membership then was 38. Ness, Steve. "Blossom Hill Mennonite Church (Lancaster, Pennsylvania, USA)." Global Anabaptist Mennonite Encyclopedia Online. October 2016. Web. 26 Apr 2019. http://gameo.org/index.php?title=Blossom_Hill_Mennonite_Church_(Lancaster,_Pennsylvania,_USA)&oldid=146977. Ness, Steve. (October 2016). Blossom Hill Mennonite Church (Lancaster, Pennsylvania, USA). Global Anabaptist Mennonite Encyclopedia Online. Retrieved 26 April 2019, from http://gameo.org/index.php?title=Blossom_Hill_Mennonite_Church_(Lancaster,_Pennsylvania,_USA)&oldid=146977.